Energetic groups of adults and kids spread out across the City of Boise’s Hyatt Hidden Lakes Reserve in early December in search of the fuzzy dry flower heads of rabbitbrush plants. The once-bright yellow flowers had turned a faded beige and harbored thousands of tiny seeds the volunteers carefully collected in paper sacks. Back at the trailhead, experts with the Land Trust of the Treasure Valley, Golden Eagle Audubon Society and Boise River Enhancement Network helped the volunteers plant the seeds in germination trays. The volunteer native plant gardeners then took the trays home to tend until the seeds germinate and the rabbitbrush seedlings are big enough to transplant. Volunteers collect seeds together. Photo by Art Robertson. All the fun is part of the Hyatt Hidden Lakes Reserve Habitat Enhancement Project, a partnership between the City of Boise and local organizations supported, in part, by funding from the National Fish and Wildlife Foundation. The goals of the project are to improve the hillside habitat by restoring native plants and provide opportunities for community members of all backgrounds to develop a connection to this unique outdoor space. The seed gathering and plant growing is part of the project’s community plant nursery, a program to have volunteers grow plants well adapted to local conditions and use them for site restoration. The rabbitbrush grown from seeds collected by these volunteers will be ready to plant at the reserve in about one year. New Americans help with seed planting. Learn more about the Hyatt Hidden Lakes Reserve project by listening to this piece by Beth Markley for Radio Boise. Local organizations and volunteers are working with the City of Boise to reduce weeds and improve habitat for birds at the City of Boise’s Hyatt Hidden Lakes Reserve. With support from the National Fish and Wildlife Foundation, the Land Trust of the Treasure Valley, Boise River Enhancement Network, City of Boise and other partners have started implementing recommendations of the Hyatt Hidden Lakes Reserve Master Plan that was adopted in 2000. Feral cereal rye dominates the hillsides at the reserve. The Hyatt Hidden Lakes Reserve Habitat Enhancement Project will improve the upland habitat on the hillsides, presently overrun with a number of undesirable species including feral cereal rye, kochia, and tumble mustard. The invasive plants provide poor habitat and pose a fire risk to the reserve and surrounding neighborhoods. Over the next eighteen months, some areas in the reserve will be treated with herbicide to kill invasive grasses and planted with drought-tolerant species including sagebrush, sandberg's bluegrass, Canada bluegrass and sheep fescue. The uplands on the western edge of the reserve will be planted in a firewise manner with low flammability shrubs such as oakleaf sumac and mockorange and low growing grasses. The transition zone between the wetlands and uplands will be planted with clusters of chokecherry, golden current, rabbitbrush, and sagebrush. 124 species of birds have been observed at the reserve. These include finches, wrens, sparrows, woodpeckers, swallows, warblers, hummingbirds, doves, quail, hawks and other species that use the uplands. With the proposed enhancements, nesting, foraging, and cover habitat for the upland birds will be greatly improved. Native plants support populations of insects and critical pollinators too. Heidi Ware of the Intermountain Bird Observatory will make a special presentation on the “Hillside Birds of the Hyatt Reserve and the Plants They Love” on Thursday, November 30 as part of the Hyatt Reserve Open House. Information about the project and the draft Hyatt Hidden Lakes Revegetation Proposal will be provided and public comments will be accepted. The Open House is from 5:30 – 7:30 pm at the Boise WaterShed, 11818 W Joplin Rd, Boise, and presentations start at 6:00. Nestled in a residential and commercial area in West Boise is a hidden gem of nature, Hyatt Hidden Lakes Reserve. The series of ponds, wetlands and hillsides blend together to create a unique pocket of wildlife habitat in the center of urban Treasure Valley. The reserve, managed by the City of Boise City Parks and Recreation and Public Works Departments, is guided by a 17-year-old community-generated Master Plan. Visitors can enjoy nature trails with benches and interpretive signs. There are restrooms and two parking areas. Community members and people from near and far use the reserve year-round, attracted by the rich birdlife, the wide paths and the outstanding scenery. A new partnership has come together with the intention of building on the past success of the reserve to improve the habitat and introduce new visitors to the site. With support from the National Fish and Wildlife Foundation, the U.S. Fish and Wildlife Service’s Urban Wildlife Conservation Program, and more than a dozen community partners, the 18-month ‘Multi-Cultural Habitat Enhancement Project’ (project) is an innovative initiative that’s already generating enthusiasm. On October 17, 2017 the group hosted a field trip to the reserve for 40 students from the English Learning Center (ELC), a skill development center for recently-arrived adult refugees. Volunteers from many organizations have already started removing debris and removing weeds to prepare the reserve for plantings next year. City of Boise Open Space Restoration Specialist Martha Brabec is drafting the Hyatt Habitat Enhancement Plan with help from volunteer habitat experts. The plan will describe the short-term strategy to improve habitat and reduce fire risk. Meanwhile, the long-term strategy will focus on continued improvements and stewardship once the initial 18-month project is finished. 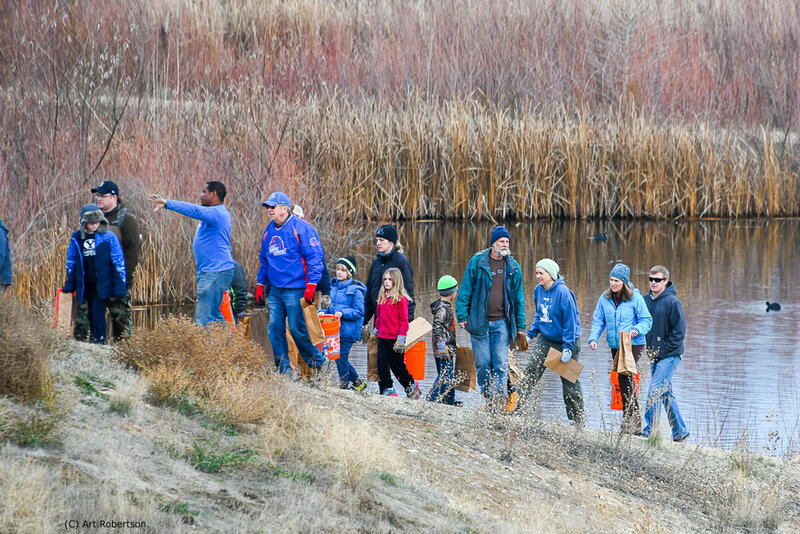 The City of Boise actively encourages community stewardship of its reserves and seeks to expand and diversify its capacity. Boise is a welcoming city that encourages community engagement and this project is no exception.